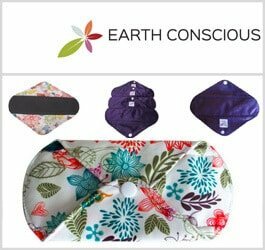 2019's Top 10 Reusable Cloth Menstrual Pads - Reviewed! A great reusable menstrual pad should be comfortable, affordable and well made. It should stay in place and absorb just as well— if not better— than any disposable sanitary pad. Today’s reusable menstrual pads are like close allies for your body, disappearing underneath your clothes and letting you live your life as you would any other day of the month. Read through for the ten best menstrual pads, and get ready to be wowed by one of the best-kept secrets in personal care. If you’re new to the world of reusable menstrual pads or are in search of a better brand, you’ve come to the right place. Most of us grew up with disposable feminine hygiene products. It seemed that the only option was to go to the drugstore and purchase what was available there: Plastic-backed, bleached out, white cotton disposables, sometimes with a funky perfume. Not only did the cost of buying them month after month quickly add up, but they could be very uncomfortable to wear (chafing, anyone?). Cloth pads can cost more up front than a pack of disposables, but they last for a very long time. Imagine not having to spend another cent on pads or tampons— for years! In addition to saving you money over the long run, reusable pads are more comfortable and are better for the environment– and did we mention cloth pads come in cute prints, too? The average American woman uses nearly 17,000 tampons in her lifetime — or as many as 24,000 if she undergoes estrogen replacement therapy. And that’s just tampons. Women also use innumerable sanitary pads in place of, or in addition to, tampons. After giving birth, some women may also use maternity and nursing pads. The worrisome thing is that sanitary pad manufacturers aren’t required to list all of the chemicals in the pads. Some consumer watchdogs have done testing on them and said they show indications that they may contain dioxins, synthetic fibers and petrochemical additives. We know a lot these days about the hazardous nature of plastic chemicals, so many women are thinking twice about wearing these plastic products so close to their skin. 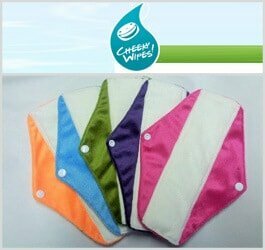 More and more stores are carrying reusable pads these days, but now with the Internet, anyone can buy high quality, comfortable, reusable menstrual pads from home. 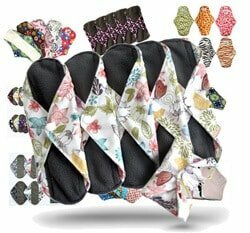 There are established companies that produce cloth pads and smaller ‘cottage industry’ makers of the pads; many of them are a home-based business of one. There is a wide selection to choose from, so we’ve scoured the market to compare as many reusable pads as we can in order to find the best. We hope to help you to make the right choice for you with this list of the Top 10 Reusable Menstrual Pads. 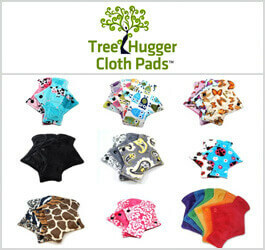 Tree Hugger cloth pads come in a variety of colors, fabrics, and sizes, all designed to help keep women and girls feeling comfortable while keeping conventional period products out of landfills. They are a small company owned by Crystal Burton, a mom of two. She and her husband Scott started their venture into cloth pads in 2008, after discovering that cloth menstrual pads are an eco-friendly alternative to conventional ones. This company sets itself apart by using luxurious fabrics in fun colors and prints, plus they partner with WeForest, and plant a tree for every single cloth pantyliner and pad they sell. 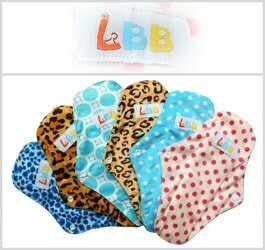 The company is based in Winnipeg, Manitoba, Canada, and produces other eco-friendly products including cloth diapers and nursing pads. Hannahpad has been around since 2005, with the aim of offering women a more comfortable, enjoyable menstrual cycle. Hannahpad reusable cloth pads are environmentally friendly, in line with the company’s goal of providing high-quality products that are healthy for its customers and our planet alike. All hannahpad products are designed and manufactured in Korea. 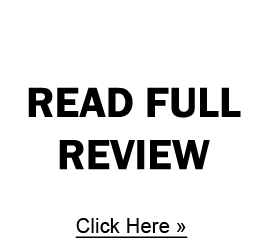 The company relies on real user feedback to make improvement, and they look forward to hearing from their customers. We think this is just one reason why hannahpad has become such a success! To date, Hannapad Global makes this product available to women in Australia, Canada, France, Japan, Korea, New Zealand, Philippines, Singapore, South Africa, and the United States. Plans for expanding to the United Kingdom, Taiwan, and Indonesia are underway. Limited Offers: $6.95 (AU) Delivery and Free on orders over AU $50.00 in Australia. 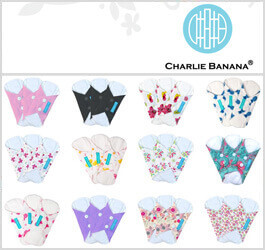 Charlie Banana Feminine Pads are an offshoot of the Charlie Banana Cloth diaper brand. The cloth diapers and other baby products are available in major stores including Wal-Mart, so this is no mom-and-pop menstrual pad producer. The pads have a white fleece top layer and a PUL outer layer with wings and a snap to secure the pads in place. PUL stands for polyurethane laminated fabric. PUL provides a waterproof barrier that stands up to multiple washings and is comfortable enough to be worn next to the skin. Unlike some other reusable menstrual pads, GladRags don’t have a plastic backing, which means less irritation. And they’re designed to last at least five years if taken care of properly. Lunapads have two parts: a pad base with wings that fastens around the underwear and a removable insert made from absorbent fleece. The Pad Base is designed to be leak-resistant. Lunapads recommends that users keep the Pad Base in place all day and then change out the insert as needed. In fact, this is given as one of the main factors that makes Lunapads different from other cloth pad brands. With most other brands, you have to change out both the base and the inserts. Changing all of that would require you to carry more with you, to do more laundry and to potentially have to purchase more items. With Lunapads, you just wear the one base all day and adjust the absorption levels with the removable inserts. 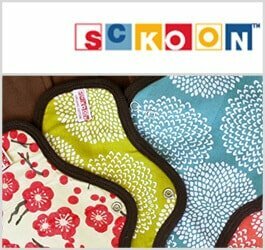 If you like lots of choices, Sckoon might be the reusable menstrual pad makers for you. Founded in 2002, Sckoon produces a menstrual cup that’s available in a rainbow of colors. They also offer loads of colorful options for their organic cloth pads. First, decide if you want waterproof or breathable pads. Then you get to choose your size. Finally, you’ve made it to the fun part: selecting your favorite print! Sckoon offers a wide selection of lovely, girly prints that you can choose from. 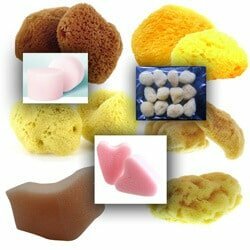 There’s also an assortment of value sets available on their website where you can get a discount off the individual prices of the pads. Domino Pads are made from high-quality fabrics such as Windpro fleece. In addition to the patterned pads, which are hand-dyed, they also offer pads that are undyed (called natural). 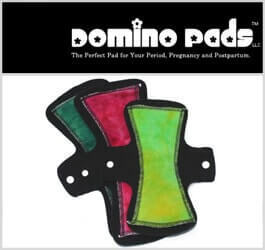 Domino Pads are available in seven different sizes and five absorbency levels and come with wings that snap closed. Keep in mind, when you order direct from the site, every pad is handmade to order. This requires a seven-day or less turnaround time for most orders to ship. To get the pads faster, you can buy ready-made Domino Pads on Amazon.com. Heart Felt is an eco-friendly company that produces household goods in addition to cloth menstrual pads. They also distribute the Cerene Menstrual Cup. We’ve put together this list in an order that makes sense to us and would work for most people who are shopping for reusable menstrual pads. However, your own list could be different depending on what is most important to you. Is eco-friendliness more important than the lowest price? Do you prefer to have handmade products with some variability or the consistency offered by mass-produced items? A beautiful design may rank higher for you than where the pad was made. Your preference also might differ depending on whether you want to have pads to cover your entire menstrual cycle or just as a backup for a menstrual cup. We tried to rank these pads in order of comfort, absorbency, durability and design. 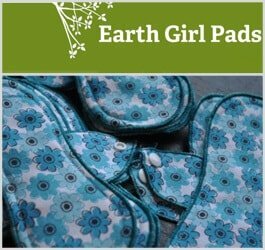 We hope this list will be of great help for finding the best reusable menstrual pad for your needs! 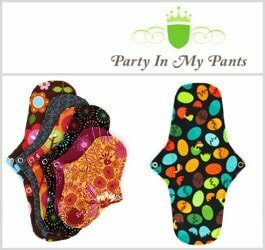 Party In My Pants (also known as PIMPS) are not your mother’s reusable menstrual pads. In fact, this sister-run business generates more of a hipster buzz than a hippie vibe. One sister is a sewing whiz and the other an art school graduate, and it shows. They offer their pads in a thrilling-to-the-fashionista assortment of trendy, quirky prints, including the much-coveted galaxy print and an unexpected line of dinosaur themed pads (at the time of this writing). 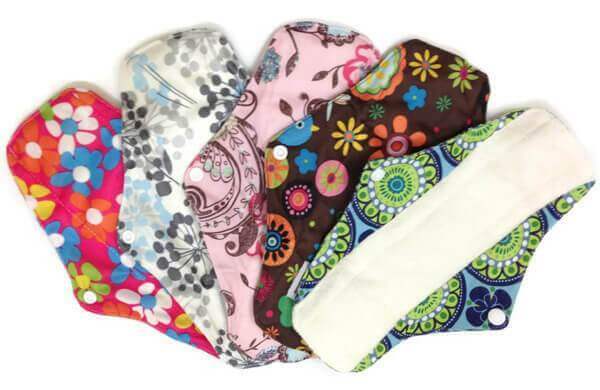 The pads come in 11 different sizes to cover all phases of the menstrual cycle. Dutchess offers a reusable menstrual pad that is the perfect complement to their reusable menstrual cups, and it seems that is their intended purpose: backup for the Dutchess Cup. The pads come in one size that is designed for light-to-medium flow. They also appear to be made in only one pattern. These pads have wings that snap into place and are about 1/3 of an inch thick. According to Dutchess, their pads contain no bleaching agents or harsh chemicals, and they offer a 12-month warranty on their products against defects or poor workmanship. WillowPads may be last on this list; however, they’ve made this list because their product is good, they have a vision for a better planet, and they’re customer-satisfaction oriented. 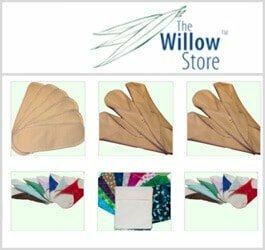 Willow Pads come to us from the Willow Store, a family-owned company guided by a vision of a better future for our planet. Their pads are made from high-quality organic fabrics that they’ve chosen for softness and comfort. WillowPads are a menstrual pad system, not an all-in-one like some other brands. They come with an organic cotton base layer with wings and an organic hemp fabric insert; this way you can adjust the absorbency level to match your flow. The pads with inserts come in two color choices: natural and black. They also offer a line of leak-proof pads that come in a collection of solid colors. 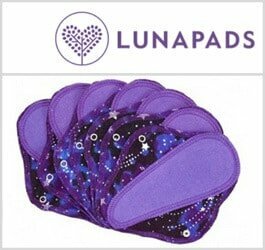 New Moon Pads didn’t make our top 10 list of reusable pads because there are very few customer reviews available for them, pretty much only the testimonials on their official website. But that said, almost all of the reviews I could find are raving (in a good way) about these pads. 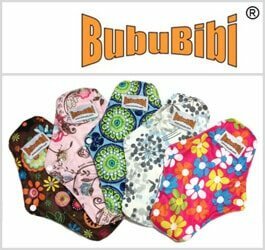 These pads come to us from British Columbia, Canada, by a work-at-home mom who describes herself as a cloth pad artisan. 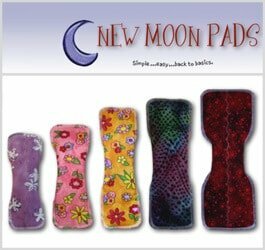 New Moon Pad’s motto is, “Simple…easy…back to basics.” Although the concept of cloth pads may be simple and back to basics, New Moon Pads offers a staggering array of colors, patterns and options for customization. With over 80 prints in stock, you’re bound to find something you love. Cheeky Mama Reusable Pads come from a company called Cheeky Wipes that makes cloth diapers and reusable baby wipes. They have a super cute logo, “Making a bum job better.” They sell their pads individually and also in full kits that contain liners, day pads, night/maternity pads and even a box to soak the pads in (called a mucky box). 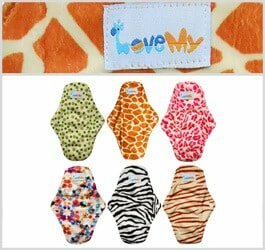 Love My ™ is a maker of cloth diapers and baby products as well as “mama pads” for women. Mama Pads are usually designed for post-partum wear, but they can also be worn during menstruation. 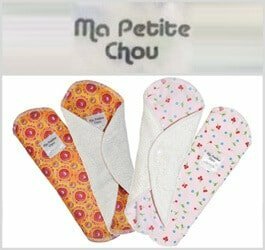 Named after a French term of endearment, Ma Petite Chou is a U.K.-based maker of cloth menstrual pads. With so many reusable pads to choose from, where should a girl begin? After reading the reviews, looking at pictures and watching some videos, a few brands of pads are probably catching your interest. Many companies will offer free samples or at least, samples where you pay for shipping only, as a way to try out their brand. Some women like to check out a new cloth pad brand by ordering an inexpensive pantyliner. That can give you a good idea of the type of materials being used to see if it’s something you’d like to wear for your entire cycle. Whatever reusable pads you choose, We wish you luck; and as always, have fun with it! I use Pink Lemonade Shop cloth pads and love the high quality and pretty prints! I was surprised that you don’t have my favorite shop listed. Wanted to point out that the information for party in my pants was not current, dont know about other companies though. How often do you need to change? What do you do when the pad is soaked and you are out of the house? Uhhh…bring more with you. Put the dirty one in a water proof bag which most companies sell as well. I would swap out the pad as you feel necessary. I know some people who like to change it if there’s any blood present when they use the toilet. Others only swap out if they soiled their pad significantly. It’s all up to you and how comfortable you are. If you plan on using cloth pads, people normally also invest in a “wet bag” or a “wet/dry” bag. These come in a variety of shapes, sizes and fun patterns or plain. They have a waterproof lining that keeps your soil pads contained. It may also have a “dry” area that you can store clean pads. 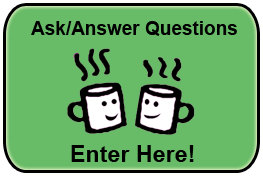 Not a comment as much as a question – How do you handle the pads that are soiled when you are away from home for long periods of time, without the availability of a rinse site? As a Relief Aid project we are wanting to create and send to areas that are struggling through the aftermath of catastrophic natural disaster, but am going to have to “sell” the ladies who are unfamiliar with this type of system on the benefits and handling of them. Thank you for all replies!! Audre. wow informative post.. do you know about athena pad. i just start using pad from this Blubear Holding company, they sell washable and reusable pad but not from cotton.. i’m not sure from what but it so soft..
It’s a nice list, but why not add indie padmakers? These are almost all China Cheapies, and all are mass produced and basically the same thing over and over. I would guess that they aren’t even the “top 10” – I suppose in sales, maybe, but as you can see, some of them certainly aren’t getting great reviews. All my favorite brands are Indie pad makers. They just work better when they are made with quality materials, and attention is put on how they fit and function, rather than how they can be mass produced cheaply. Thank you for pointing this out! I use cloth pads for a variety of reasons, and one of them is definitely not to encourage slave labour. There are a few YouTube videos on it, but these Chinese cheapies are not good for either the environment or the women who make them. They have been known also to refuse to allow owners of these resale businesses to tour the factorys or facilities, meaning you cannot guarantee the organic bamboo claim. Small Business owner on sites like Etsy and are a far better option, and you can communicate directly with the makers. I agree with you Marie, Yurtcraft is my absolute favorite, but I do prefer indie pad makers over mass-produced brands. Support small business!! Does anyone know of reusable pads that don’t have snaps (maybe velcro instead)? My bike is my primary mode of transportation and snaps between me and a bike seat = ouch! I am a small, Canadian independent maker of cloth pads (gardenofedenreusables.com) and I have recently started making an “H” pad at the request of a customer who is an avid cycler. She found that the snap in my standard pads hit her in all the wrong places! So, the H pad is a fold-over pad that does the trick. She found the absorbency good, as well as comfort while in use. Her one suggestion was to wear well-fitting underwear as the H pad can shift while cycling. Otherwise, that might an excellent option for you to investigate. When the snap is not the plastic KAM snap, you likely will not feel it. I love my “old fashioned metal snaps”, cannot feel them at all! It is the only one I remember, but I know I’ve seen some others too on Etsy with the option of velcro snaps, but I can’t remember who. wow! this is such an informative post. thank you so much for talking about such an important topic. keep writing about such important topics. I also read about it here and thought it should be shared with others too. Can you provide me with the reusable menstrual pads which has a set comprising 3 winged pads, 2 straight pads, 2 holders and 1 pouch for storage. They should be made of cotton, preferably flannel. I’ve used my Cozy Folk pads for years. They’re made in the USA (very important to me, now that even cloth pads are being made in sweatshops these days) and are SO soft and pretty! You can find them on Etsy or at cozyfolk.com.